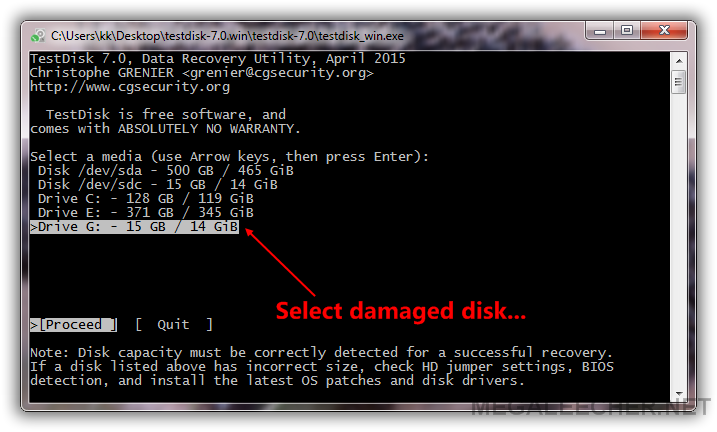 The gem, I found was TestDisk - a powerful, free and open-source (GPLv2) data recovery software designed to help users recover lost partitions and/or make non-booting disks bootable again. Download TestDisk from here - http://www.cgsecurity.org/wiki/TestDisk_Download for your operating-system, I am using Microsoft Windows 7 for this tutorial and the SD-card is formatted with FAT32 file-system. Run "testdisk_win.exe" and select the damaged disk from the provided plugged-in disk list, double check you are selecting the correct disk. Select "Advanced" Filesystem Utils and Proceed. 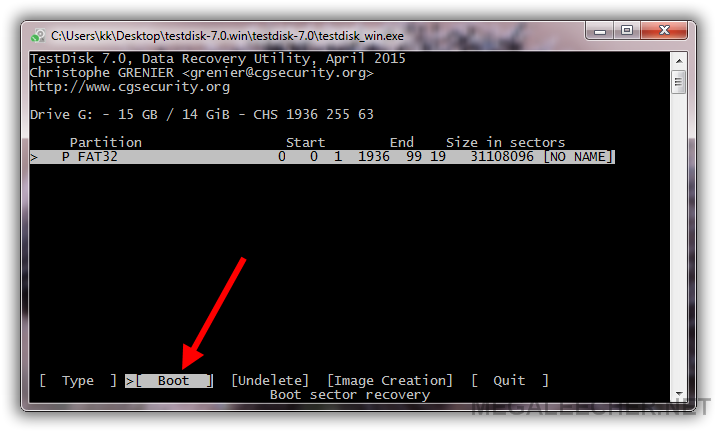 Select "Boot" to enter boot sector repair options. As you can see in the example below the card's boot-sector is bad, but luckily we have a backup boot sector which is OK, proceed with "Backup BS" option to copy backup boot sector to main record. As you can see the main "Boot Sector" is now fixed and labelled OK. The SD-card is now fixed and detected normally by computer, the full file-structure is intact and all files are accessible. 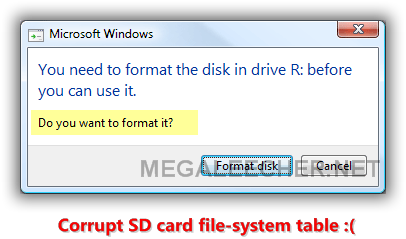 It is advised to backup full SD-card to your computer before unplugging the SD-card now as it can get corrupted once again. I agree. I found TestDisk a few years back just like you after having tried a lot of software to recover all my partitions on a HDD. 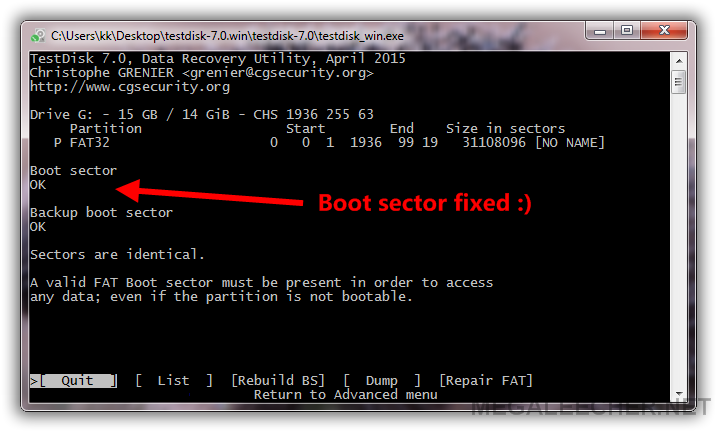 While using Ranish Partition Manager, I restored the MBR/partition table (instead of the boot-sector i.e. boot routine) from a saved file. 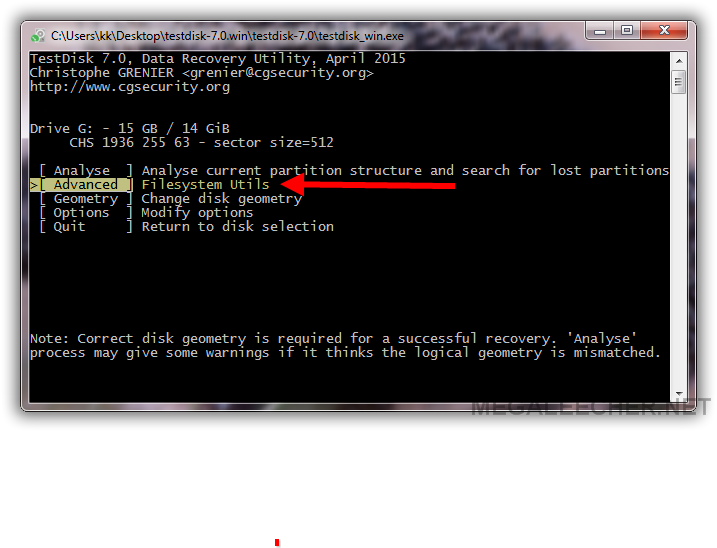 So, the partition table on my disk was reset and none of the utilities were working with it. 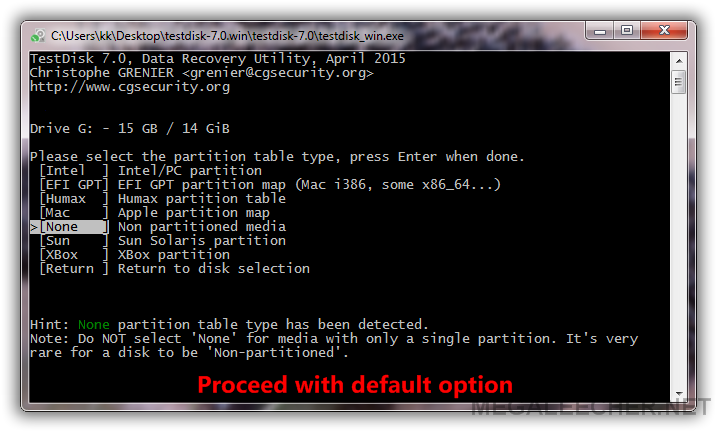 TestDisk was able to not just find my partitions, it even restored the partition table as it was. Since then, it has been part of my recovery software collection/boot disks permanently. 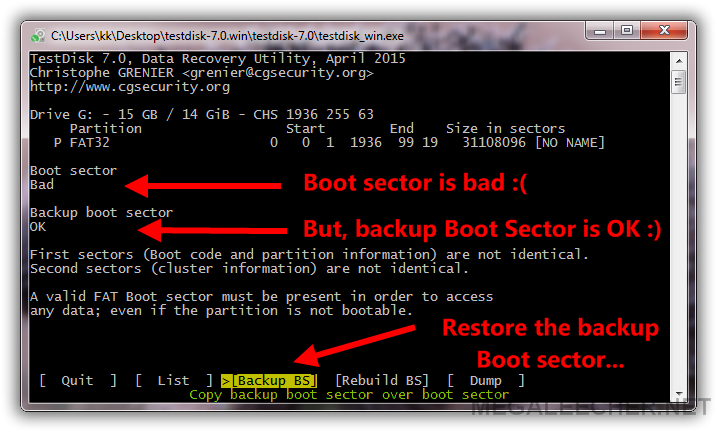 But when I get to the 5 stage both my boot sector and back up boot sectors are BAD, so how do I proceed please? I tried the first method but may screen did not show backup BS, so I tied the second method and it worked. Great thank you....now to the donation page. I thought i removed the disk properly while it was off but apparently it didnt dismount properly and now lots of important files are locked away behind the "needs to be formatted" message. Appreciate any advise to help me rebuild the boot sector and get it back to normal! It says 2 disks, how many disks you have in your computer? those are the TWO disks the software reads. but like i stated, it's reading my 512gb SD card as ONLY 32MB. I have NO jumpers or BIOS i can access. it's a WACOM Mobilestudio. Any way to fix my problem? 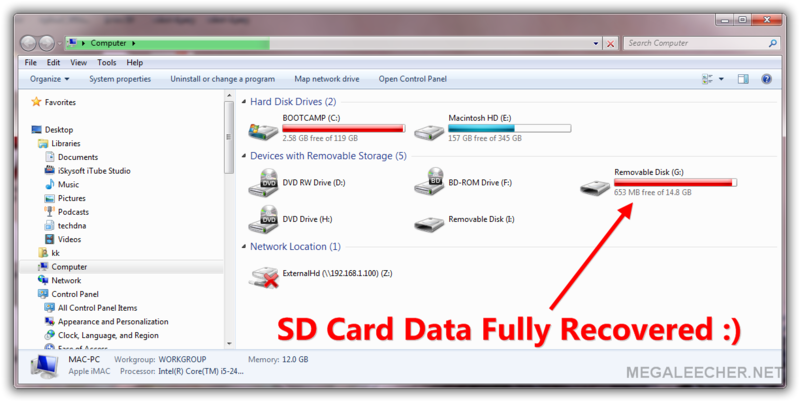 Try using a different SDCard reader and port, if you card is not getting detected you cannot recover data from it. When my android phone's internal memory was full I inserted SD card having FAT32 partition and card was in use in digital camera. I took several photos and videos from my android phone for 2-3 days. I was able to see them in phone gallery. When I removed the card from phone and inserted it in PC to transfer the photos, I couldn't find them, but I could see the old photos on the card taken from Digital camera. Some how boot sector created by Android was moved/ deleted/ hidden. Card is active and good but doesn't shows the required data of 2-3 days. How to recover it??? I tried TestDisk and it shows two FAT32 boot sector, one is same what i can see and another mentioned as deleted and having no data inside. Testdisk on Android with DosBox how? Testdisk on Android with DosBox emulator installed. i tried mounting unmounting extSdCard, but no luck..
how can i do so ..as I dnt have a computer. this extSdCard is vfat..as in terminal it says . Someone get it to work..recovery on ANdroid itself of sdcard without ROOT. Is it possible or access permissions would stop it? I have a 256 GB Micro SD card with a bad backup boot record. I have selected "Org. BS" to copy superblock over the backup sector. 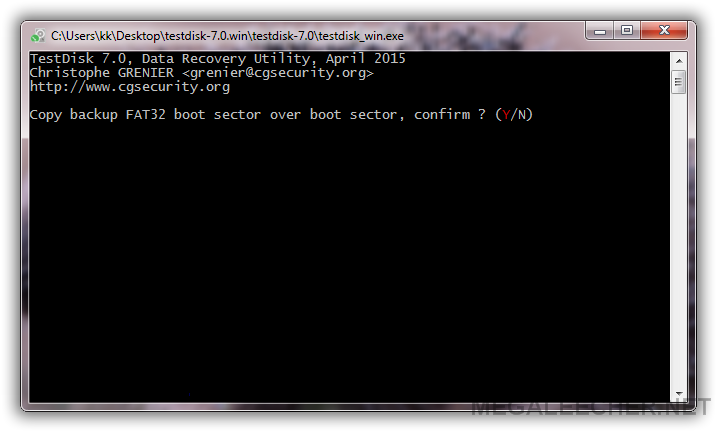 Copy original exFat boot record over backup, confirm ? (Y/N) displays but I am unable to confirm. Typing Y and or enter has no effect. What am I doing wrong? This is a nice post. Plugging in the SD card into your PC to find out it is not getting detected could be the worst nightmare for anyone having thousands of pictures, music and other important data onto it. Thanks! !